There are far mightier braided rivers in Canterbury, but the modestly sized Ashley-Rakahuri is a taonga of a value disproportionate to its size. For the most part the Ashley-Rakahuri weaves through highly modified rural farmland where indigenous natural New Zealand has almost been scrubbed from existence. 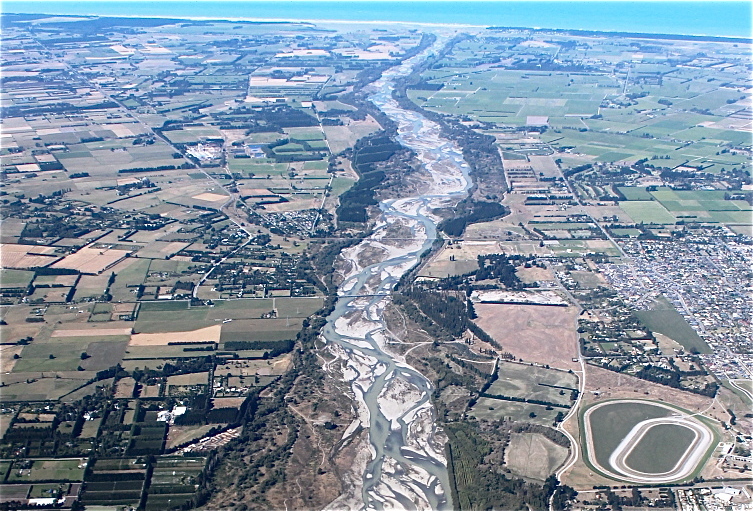 But the braided river channels of the river itself are a largely unmodified natural environment that has been a unique feature of the Canterbury plains for eons. Braided rivers are rare in the rest of the world, with New Zealand considered a hot spot, and Canterbury the centre of that, with 59% of the country’s braided river surface area. They are the home of highly adapted braided river specialists, chief among them being the birds. Among its labyrinthine waterways, dynamic shingle islands and stony banks breed some of the most endangered birds in the world. In a relatively short span of riverbed quite close to the township of Rangiora nest three of the principle and most threatened braided river specialists: The black-billed gull (the most endangered gull in the world), the unique wrybill (under threat and the only bird in the world with a bill that bends sideways), and the beautiful black-fronted tern (also an endangered species). Where the Ashley-Rakahuri reaches the sea, just 25 kilometres north of Christchurch, it spreads out into a large, generally unmodified estuary that is ranked as an internationally important wetland with a host of resident and seasonally visiting birds. It is a vital stopover site for birds migrating up and down the coast, and beyond; including the iconic kuaka (bar-tailed godwit) and other Arctic migrants that live out their winter in our summer. Unfortunately, the ecological values of these braided river systems are increasingly threatened; most have been invaded by introduced weeds and introduced mammalian predators, and are further degraded by a wide variety of human activities. From its gorge—a popular swimming picnicking and fishing spot—to its mouth, the Ashley-Rakahuri, being so accessible and so close to Christchurch, is particularly vulnerable to these pressures. But, being so small in comparison to the bigger braided rivers, the Ashley-Rakahuri also offers a unique opportunity for effective intervention; initiatives to protect the river in places where the most threatened of birds are known to feed and breed—predator trapping, weed clearance, public education, vehicle discouragement and monitoring—are showing signs of at least stopping the decline of the endangered species, perhaps even reversing it. While the protection efforts at the Ashley-Rakahuri focus on the wrybill, black-billed gull and black-fronted tern, many other bird species benefit. The braided river is home to such other key native species as the tuturiwhatu (banded dotterel – Charadrius bicinctus), the poaka (pied stilt – Himantopus himantopus) and the torea (pied oystercatcher – Haematopus ostralegus). The very rare kaki (black stilt – Himantopus novaezelandiae) has bred occasionally on the river in recent years (mated with a pied stilt) and over-wintering kaki are regularly seen in small numbers on the estuary. Migratory wading birds are the spring through to autumn stars of the estuarine environment. Here I have seen godwit, knots, whimbrel and turnstone. The number of resident species at the estuary is also substantial. Along with the mudflats, dunes, sand and shingle banks are freshwater ponds and creeks, reed and raupo beds, scrublands and grassy flats, providing a multitude of environments for birds to live, breed and feed in. The native birds I have seen along the Ashley-Rakahuri include: the shags (pied, little, spotted and black); the large waders (Australasian bittern, royal spoonbill, white heron and white-faced heron); the intermediate-sized waders (spur-winged plover, South Island pied oystercatcher and variable oystercatcher and oystercatcher hybrids); the waterfowl (black swan, grey teal, New Zealand shoveler, paradise shelduck, New Zealand scaup and Australian coot); the terns (black-fronted, white-fronted and Caspian); the gulls (red-billed, black-billed and southern black-backed); and the birds of the forest, air and riverbank (harrier, welcome swallow, kingfisher, grey warbler, silvereye, and fantail). The estuary is also home to large number of introduced game birds such as mallard and Canada geese; and introduced field birds such as skylark, chaffinch, yellowhammer, redpoll, sparrow and goldfinch. The above lists are by no means exhaustive as they are only my observations; other species are recorded as regular, occasional or rare visitors. This abridged post is from Steve Attwood’s blog. Read the full story (with more gorgeous photos) there. Thanks Steve for letting us share it here on the Conservation Blog.